The Best Work Boots Reviews For Men And Women. The Mix of Comfort and Safety. Work boots are the most understated but important part of your daily work. Choosing the best work boots can help with protecting your toes, keeping you firm on slippery surfaces, protecting your feet from exposed nails, keeping your feet warm in cold weather, and even protecting you from electrical surges. Apart from this, good work boots, either it's for men or women, also ensure comfort. Since most of the workday is spent standing on the feet, a poorly fitted pair or a non-comfortable design can prove to be horrible for your feet. However, some particular features explain the quality of the pair and authenticity of the manufacturer. I laid down a checklist below that you must cross-check with before buying a product. There are various factors to keep in mind before investing in a pair of sturdy work boots. We have broken down the list to help you choose wisely and spend your money well. Here are the types of work boots available in the market today. The primary responsibility of work boots is to protect the toes. Safety toe boots keep the toes safe from any injury and should be the top priority when it comes to selecting the best work boots. One thing you should remember is standard boots adapt to your feet with time; however due to the reinforcement in safety toe boots, they will not change with time. So always pick a pair that fits snugly to your feet. There are three major types of safety toes available- Steel, Aluminum, and Composite. Steel is the standard material found in most safety work boots. However, it is the heaviest of the three metals. For those working under cold weather conditions, the material type should be avoided, as steel conducts temperatures. Aluminum is lighter than steel but bulkier. It is not apt under the cold weather as well. So only choose the steel or aluminum toe boots, if you are working in normal or warm climatic conditions. So next comes the composite toes, There are various types of composites. The popular ones are - Kevlar, plastic, and carbon fiber. Their advantage is that they can be used in any weather condition and are lighter than the previous two metals. These work boots come without safety toes. This kind of work boots is used in safe work environments. 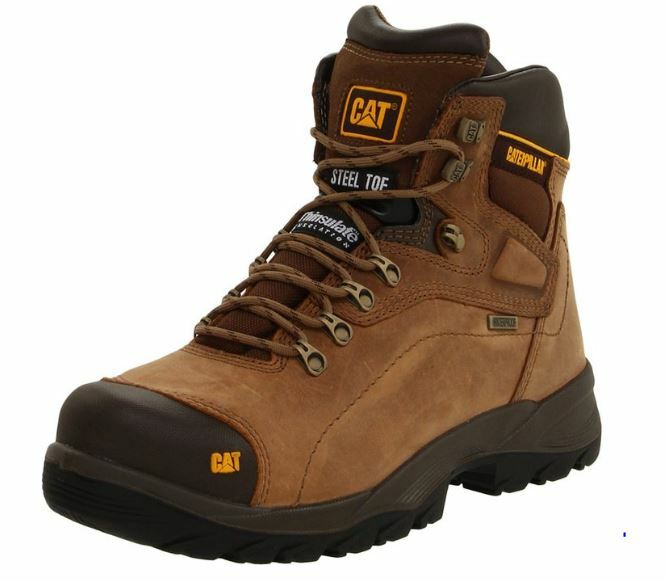 These type of work boots are best to use in some lower dangerous environment. The chances of injury are null or most depressed at such workplaces i.e. restaurant, medical institutes, teaching arena, etc. If your job demands to work in some wet conditions or you live in a place with the snowy or rainy weather, you should consider buying a pair of waterproof work boots. While these boots are available in various materials, leather or nylon mesh boots are the best to try. Leather boots are usually heavier and bulkier than the regular ones, while nylon mesh boots are lighter and come with an additional waterproof layer. The waterproof feature is a must in the work boots as once the moisture enters the leather layers, it invites unrepairable cracks and discoloring. Sometimes you have to work under the conditions where there are chances to catch an electric shock. Like maybe a bare wire is laying on the ground, or you touch an electrical outlet accidentally. The shock-proof work boots don't allow the current to get into the earth through your body and keeps you safe. Another thing I want to mention is that you should make sure the upper of the work boots and the toe are also shock-proof. Sometimes, you are fixing a fault while sitting on your knees. Thus, the bottom of the boots stands verticle, and the claw area touches the ground. In such a case, you may catch some current. Do cross-check this feature. Insulated work boots come handy for those working in cold weather or winter season. The feature keeps the environment inside the boots warm. 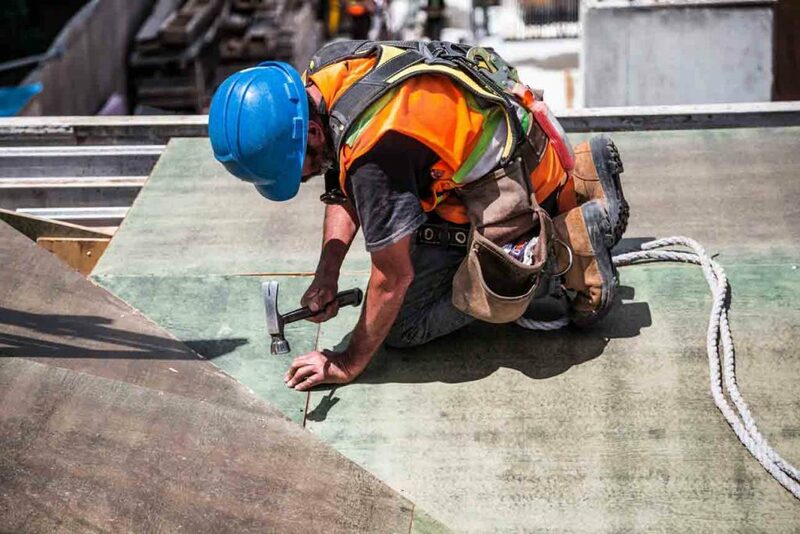 Make sure to invest in an insulated pair of work boots only if your work environment demands it otherwise wearing them in hot weather can make the feet extremely sweaty and uncomfortable. There are special work boots for workers who work on ships or in the food industry. The sole of these work boots is made of a very special rubber that helps staying firm on extremely slippery floors. Thus, with high traction, a person doesn’t feel worried about getting slipped or injured. Another feature that the good work boots must possess is shock absorption. The sole and upper both should be capable of defying the shock. If something heavy falls on the boots, the upper should be robust enough to absorb and nullify the shock before conducting it to the toe area. On the other hand, the sole and the footbeds should be capable of doing the same against the jerks from the hard surfaces. These are the additional protection given to the upper part of the foot and the toe area. 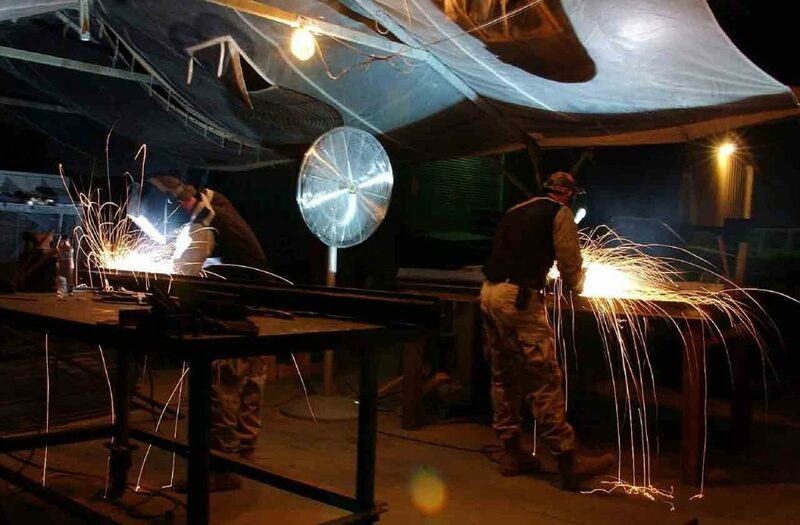 The feature is compulsory for the welders. Also, people who are working in the conditions where there are chances of exposing to some cinders or molten materials must also go for a product with a metatarsal guard. It is like putting your feet under a complete armour. Of course, how can I forget about the ladies? Men do not consider much about the aesthetic look of the pair especially if these are work boots. But, women are more conscious about looking trendy. That's why I included some super stylish products with all the safety features in the recommendation section of this article. As a quick recap, depending on your job environment and the area you live in, you should consider investing in a pair of work boots that will ensure comfort and safety. While steel ﻿﻿﻿﻿toe boots do provide security, they can get bulky. If your job does not entail lifting heavy workload, steel toe work boots may not be the perfect fit for you. If your job environment is wet and slippery, you should consider investing in waterproof work boots or slip-resistant boots. For workers working in an atmosphere with threats of electrical hazards, they should consider purchasing a pair of electrically insulated boots that offer protection from an electrical surge. Hopefully, so far, you have selected the type of work boots for yourself based on your working conditions. Now, it's the time to narrow down your selection further. No matter, what kind of boots you go with it must adhere to some safety and manufacturing standards. A salesperson might try hiding the facts from you; however I have taken some special care to enlist the core features that make a pair the best fit for you. While it is always a smart decision to invest in a famous and reliable brand, there are products from some lesser-known brands that fits everyone's budget but provides the stellar quality safety and comfort. You don't need to worry much about finding such names as I have included them under the recommendation section. Good work boots are all about comfort and longevity. Different materials have different life spans and uses. 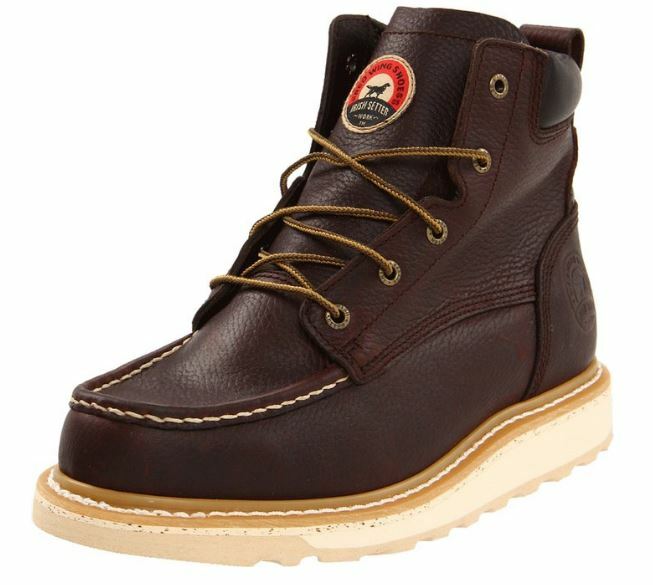 They are made of leather, rubber, or nylon, but I recommend a leather work boot as the top choice. If you are working in some warm weather, you should purchase boots made of leather or nylon mesh or a combination of both. Such materials are lightweight and flexible and are ideal for hot climatic conditions. For winter conditions, the material doesn't matter much, but it should be a waterproof one. On the other hand, they come in different styles such as laced up or slim design. Although the material & style has nothing got to do with the safety, yet it decides the level of comfort. For example, If you work in some construction firm, you must choose a lace-up pair with high neck. It prevents debris from entering into the boots. The work boots are manufactured with different construction techniques. First is the Stitch down technique. These are the only kind of boots that can be re-soled in case the sole goes ripped off. Second is the cement construction boots that are a lesser expensive option where the upper part of the boot is glued to the sole. The third and strongest type is the direct-attached boots that have a strong bonding between the top boot and the sole. These two portions are molded together. You can choose as per your budget. The boot fitting directly decides the level of comfort that a pair provides. Be very careful in choosing a pair and it must fit you snugly. Always try on the boots during late morning hours and wear a pair of socks while trying them on. In a case of insulated boots, always buy a pair that is half a size larger to allow extra room for wet socks. Although you know the essentials of buying the right work boots yet finding such a product that matches the criteria is a tough task. 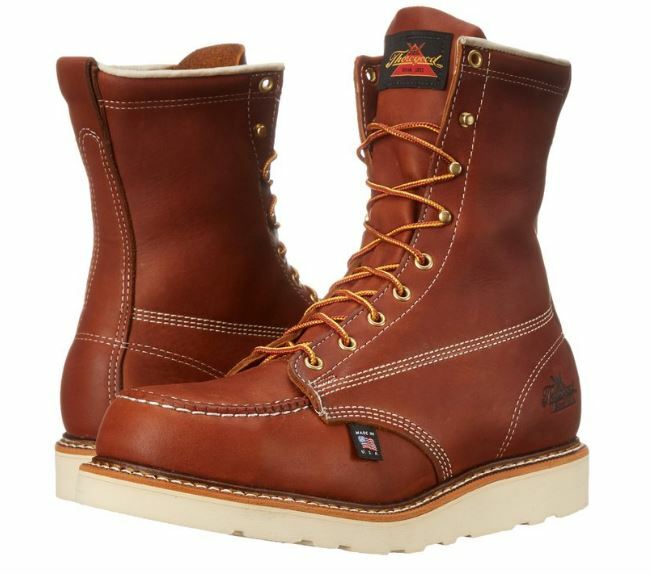 But not anymore as I have researched and examined the various brands and their different models and handpicked some of the top rated work boots. These work boots are, no doubt, the best options available and pass mandatory comfort and safety standards. Here's the list, pick and enjoy. These boots come from the house of Thorogood, which is an established name in the American footwear market. They have been around since 1892 and are the veteran of the field. The particular boots are comfortable to wear and are highly durable. Although they appear to be heavy, in actual, they are light, and you can wear them for longer durations without any discomfort. These brown tobacco boots are made of genuine leather and come with a synthetic sole that is slip resistant thus making it comfortable to wear in some harsh conditions too. Unlike most boots that are bulky and chubby looking, these look quite stylish and can be teamed up with a pair of jeans or trousers. These boots are available in two bright colors i.e. Tobacco and Tobacco Oil-Tanned, which makes the boots look elegant. The boot has an ultimate shock absorption dual-density footbed that protects the foot from excessive forces or pressures. Besides, its cotton drill vamp lining and shock-resistance feature add to its utility. The size is bigger than its denoted number. Sometimes, you need to wear socks so as to make them fit. The brand itself is extremely trusted and so is the product. You can bet on it. If you have a moderate budget, go for it. If you love the rugged looking boots, this product is ideal for you. The best part is that you can choose from a wide range of colors or just pick them all to match your wardrobe perfectly. They come from the house of Justin Boots and are the perfect rugged worker boots you will find on the market. 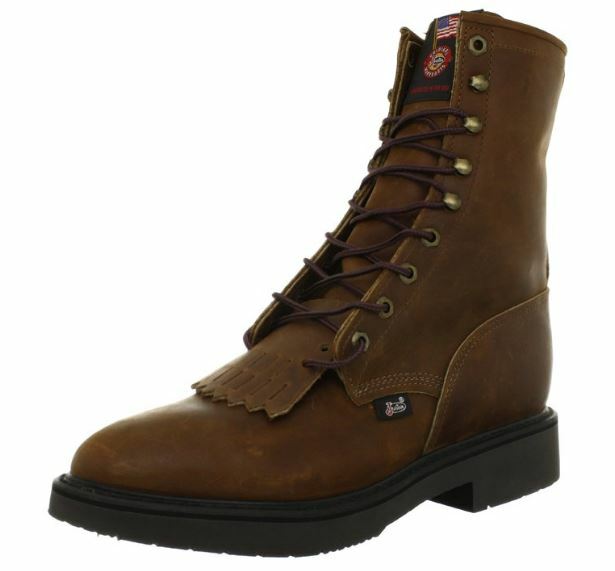 These boots are made of pure oiled leather and come with an 8-inch leather shaft that adds to the beauty of the boots. Unlike most boots, these boots are sleek and stylish and also very light weight. They have a seven layer with double cushion system that increases comfort as well as durability. Takes a while to break in the boots. Some hits and trials needed to find the right fit. A must-have pair for the construction workers. The long neck keeps the debris away from your feet. It has a classic and elegant design. If you've got to work in some extreme hot conditions these boots are perfect for you. They are heat resistant and come with a cushioned polyurethane footbed and EVA midsole that keeps your feet comfortable even in harsh working conditions. If you've been suffering from foot aches because of your boots, it's time to replace them with these super comfortable Wedge Worker Boots that have been specially designed for comfort. The Red Russet leather upper is triple stitched that provides enough durability, and you don't need to worry about buying another pair for a few months. They are also a lot more affordable in comparison to most of the other boots available on the market. Besides, its padded collar also provides extra comfort to the foot, and its soft toe meets all EH safety and security standards. Rubber Sole for added comfort. Electric Hazard- Meets ASTM standard. Traditional Lace-up with metal eyelets. Lack insulation and waterproof features. Its an another name of the comfort and safety. The boots keep your feet warm but don't let it go hot and uncomfortable. Must choose this pair if you work in some hot environment. 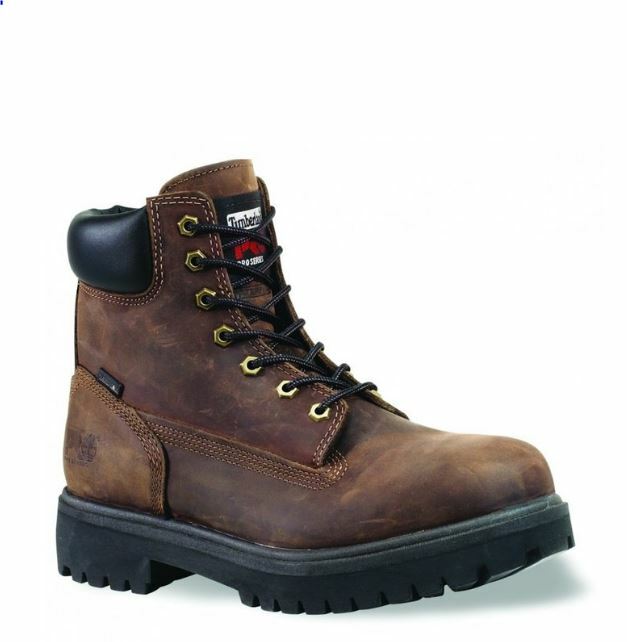 These boots are specially designed for men who work under harsh conditions. They are durable and look much stylish. These boots are highly affordable and don't require to replace for a long time. The Caterpillar boots are studded with insulation feature providing extra warmth to the foot. They also have a nylon mesh inside that prevents moisture to form inside the boots. Besides, it has padded collar offering comfort and support. It has a antiqued lace-up shaft and Nylon mesh lining that wicks away the moisture from the boots. It provides a round-shaped steel toe which protects the foot toes from work hazards. Traditional and secure lace-up system. Lining to keep feet dry. Not very sturdy for a waterproof pair of boots. No one can doubt on Caterpillar brand. The right pair of boots for them who have to encounter with slippery surfaces such as butchery workers or rainy conditions. Get them. It is the perfect pair for people who work in construction firms. They are insulated and come with waterproof leather and seam-sealed construction that ensures your feet will stay dry and warm all day. These boots are a little heavier in comparison to the other boots. They have a rugged look and is available in four different colors mainly black, wheat nubuck, brown, and brown oiled with full-grain that give these boots a stylish and classy approach. Steel safety toes for protection. A secure lace-up system with padded collar. The boots are designed for the durability. The pair has a very long lasting lifespan as it is made with Direct Attaching technology. 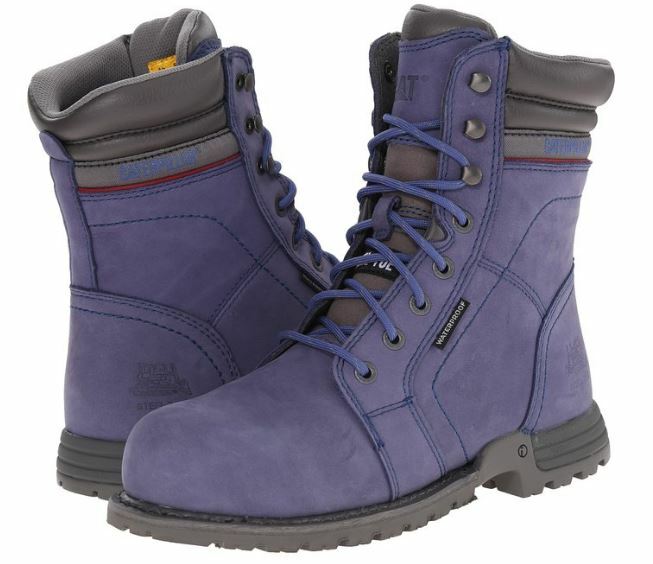 If you work in some harsh conditions and need a rough and tough pair, you must try this pair. It will end your search for the best choice. These stylish boots are super comfortable and can be worn to work for longer durations without any hassle. They provide incredible support to the feet and are lightweight that make it easy to walk around with. The boots have a removable dual-density insole that absorbs shock and makes it a safe pair to wear in jobs like welt construction. The pair comes in two colors black oil and tobacco which looks very elegant. These boots are designed with extreme expertise and craftsmanship. Its fiberglass shank offers excellent comfort and support where its Vibram outsole delivers exceptional durability. It also has an elegant moccasin toe and a wedged cushioning sole. Take a while to break into. Made for those who have to stand for long hours or have to walk a lot at the workplace. A heavy pair may put constant stress on feet if your day involves a lot of walking and standing. These boots are specially designed for the purpose and are as light-weight as air. While the world speaks about equality and many employers are now hiring female workers, it is tough to find the same variety of work boots for ladies. There is absolutely no difference in work boots for men and women apart from size and, in some cases, color. These work boots for women are the most comfortable. They are lightweight thus make it very easy to walk around in. 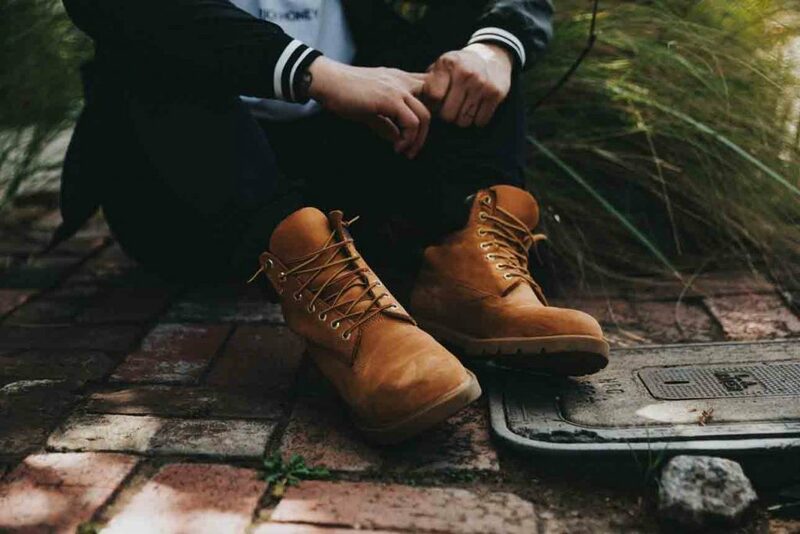 The best part about these boots, they come with a Full-Grain Stain- and Water-Resistant Nubuck Leather Upper with Lace-Up Closure that ensures your feet remain dry. The boots are a combination of leather and textile and have a rubber sole that makes it anti-slippery. It also comes with a removable EVA footbed, so if you suffer from any foot related problems you can use your orthotics. These boots come in three different colors i.e. Black Olive/Madder Brown, Gargoyle/Capri Breeze, and Gargoyle/Jade Green. All these combinations are breathtaking and tempting. These boots are best for the ladies suffering from heel spurs. The sole is highly resistant and provides you with a slip-proof base even on snow or hilly area. Hard to break-in, one may get blisters. I call it an orthopedic pair as it goes extremely comfortable on your feet. Even those suffering with some foot conditions can use this pair and experience the relief. If it's all about comfort, no other product can surpass this one. These work boots are made with waterproof leather. Its has a nubuck leather upper. 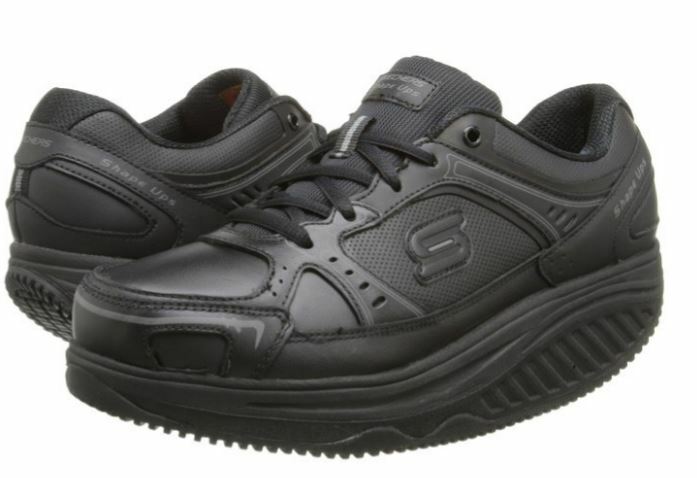 The steel toes offer excellent protection from work related hazards. These boots work perfectly in wet environments and are extremely durable. These work boots come with a removable, dual-density ethylene vinyl acetate footbed and compression molded ethylene vinyl acetate midsole that is known to be most comfortable cushions. These boots are suitable for them who have to stand for longer hours and are suffering from the foot problems such as narrow heel, flat foot, long arch, or arthritis problems. These shoes provide comfort, protection, relief, and spacious room for the toe to wiggle. Besides, these shoes are compatible with all weather conditions be it summer, rainy or winter season. A waterproof and slip proof pair for women. If you day routine is all about being exposed to the water, you must keep this pair in your wardrobe. These boots are aesthetically elegant and suits to the fashionable trait of women. Available in two colors, the Caterpillar Women's Echo WP ST Work Boot is made of leather and comes with a rubber sole for added comfort. These leather boots are waterproof and are made to last for a very long time. They are sleek and look feminine that adds to its beauty. While they are work boots, they are made to look like a fashionable pair of footwear. 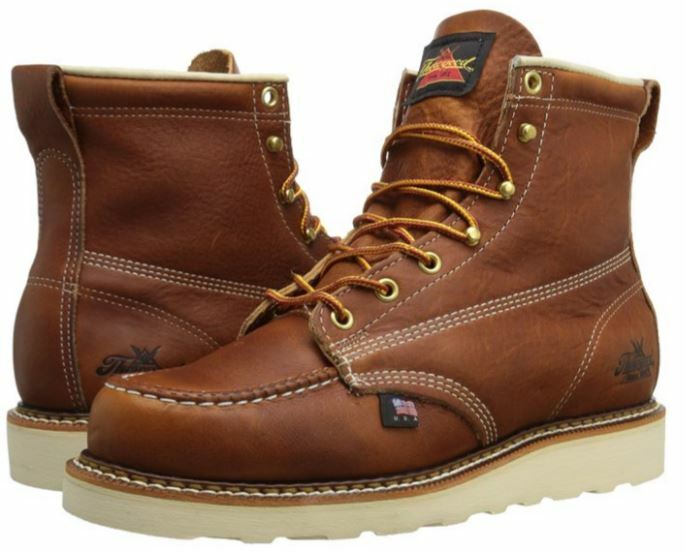 Besides, the boot has the nubuck upper and steel toe offering safety to the foot. Outsoles are slip-resistant and rugged to provide great comfort to the feet. 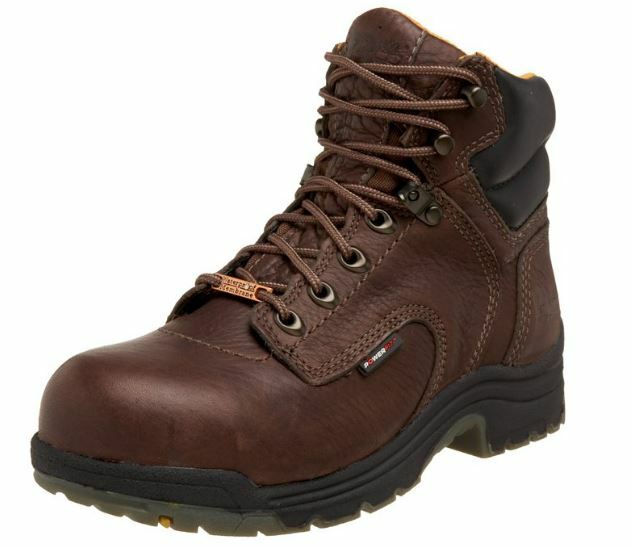 These boots are designed well to work in harsh condition too as they are made with safety fort-driven iTechnology. Sleek design makes it tight for chubby feet to stay comfortable. I call this pair as being the perfect work boot for women. Reason being, it is designed for the safety and comfort, it aims to look trendy and fashionable, and it is intended to be waterproof and slip proof. Best of the work boot features meet in this pair. Sketchers is a reputed brand, and the boots are created for the woman who needs a pair of rough and tuff boots. They are the best-looking boots on the market for females and are super comfortable. They keep your feet comfortable even at the end of a hectic day at the workplace. 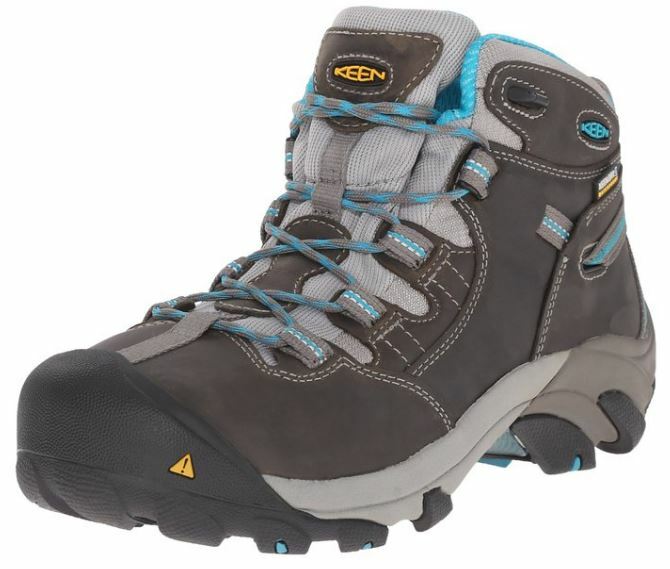 These boots are waterproof and super lightweight. These boots are slip and oil resistant that offers durability as well as excellent gripping. The design is made to keep you safe from any electric hazardous situation. The shoe comes with a traditional lace-up system providing you a secure fit. Besides, its soft foam midsole is designed to absorb the shock to keep your feet safe and comfortable. Made from a combination of leather, synthetic, and fiber, they are the most comfortable and affordable boots for women. For the ladies, working in the electric department should choose this pair. It is extremely light-weight and highly electronic shockproof. This fabulous pair of boots is made of full grain waterproof leather. It has a rubber sole that provides an excellent traction in wet conditions. 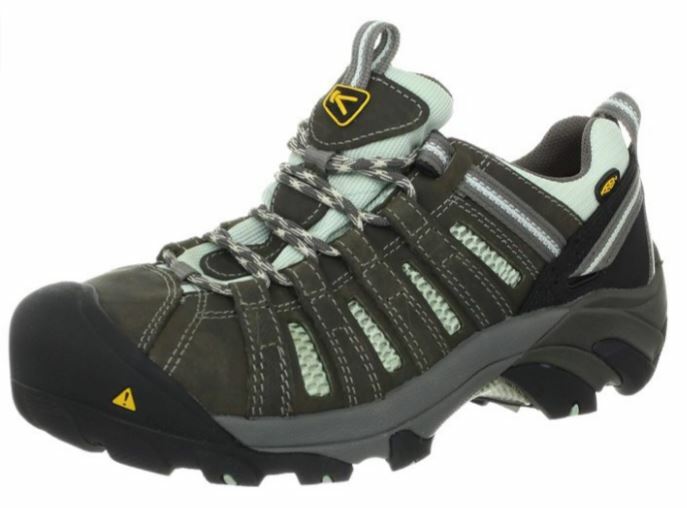 It has a steel toe that provides a safe roomy fit for the toes and protects from industrial hazards. The boots look sleek and are extremely durable. Besides, its soft leather minimizes the break-in time that is appreciable. It's Mesh Comfort Lining is antimicrobial treated and has a Polyurethane midsole and footbed offering extra durability, and comfort. The boot is the slip and odor-resistant and provides excellent protection to the foot ankle. Not comfortable for standing for long hours. Another great pair made for slippery conditions. It is waterproof and slips proof. Moreover, it also prevents water from spilling into the boots. Indeed, a great pair of work boots. Irrespective of the type of work boots you buy, always take great care in maintaining and cleaning them regularly. Start by wearing your new pair and walk around the house for a few days to help them break in. Using a conditioner will also contribute to quicken the break in period. Without a doubt, this is one of the best work boots reviews that you may have come across. Remember all the tips mentioned here and take care of your feet. 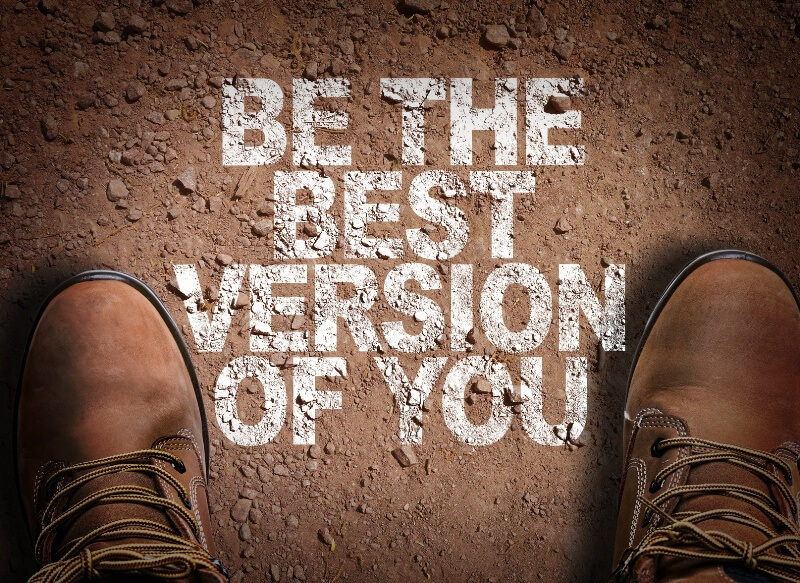 Investing in the perfect pair of work boots will go a long way in keeping you safe at your job place and in keeping your feet healthier and happier.